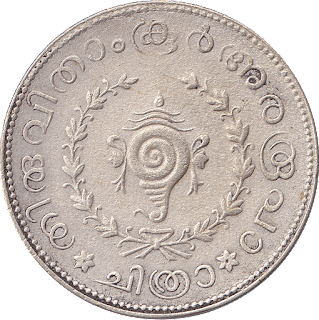 Earlier coins of Travancore were manual hand struck coins which were beautiful. 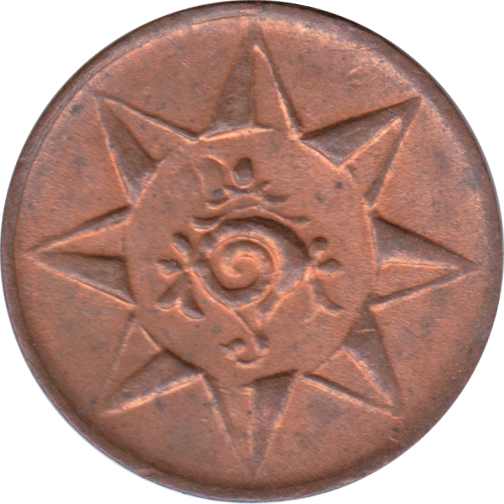 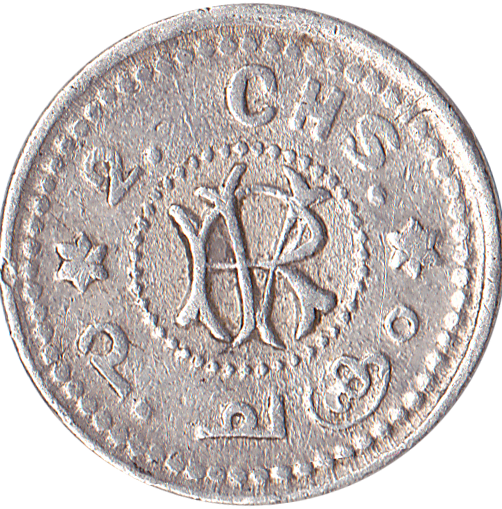 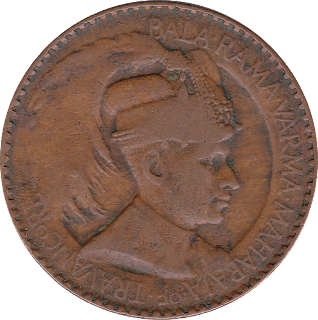 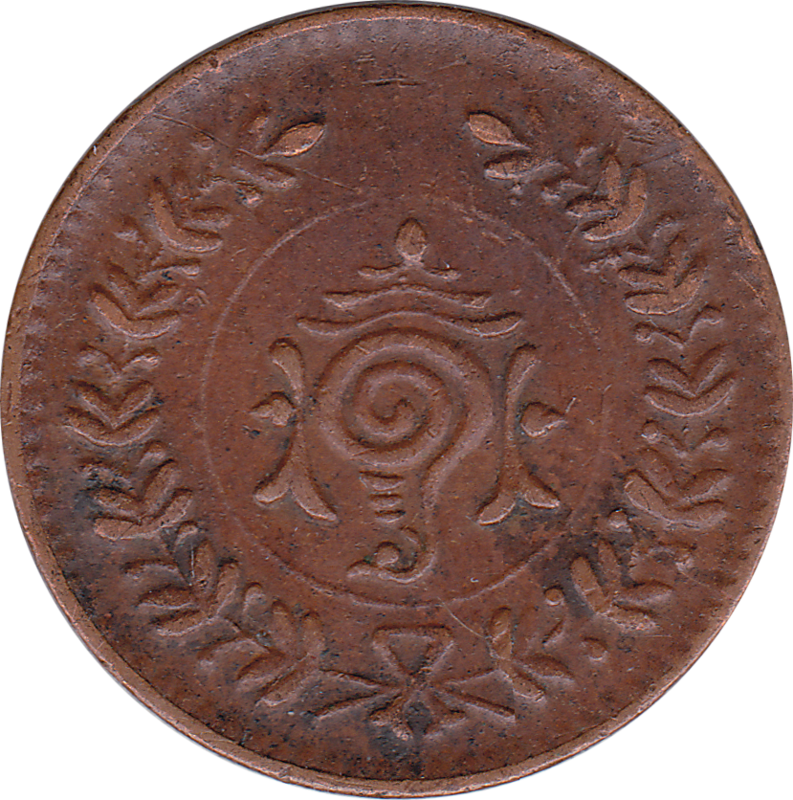 But many of them(especially common copper coins) did not survive the humid tropical climate of the region and hence those are very rare. 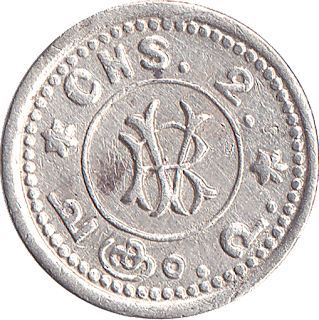 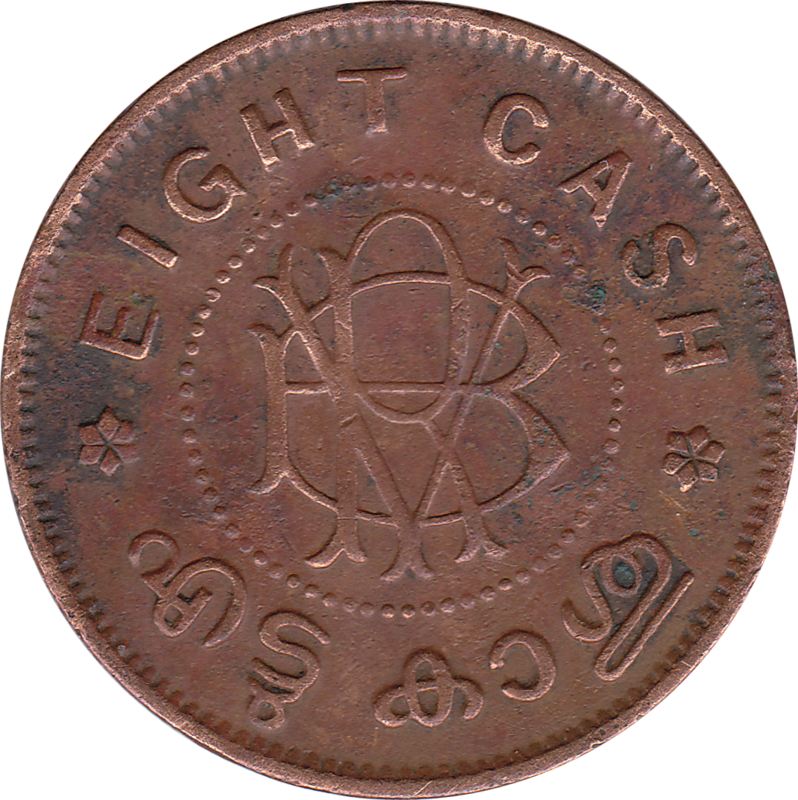 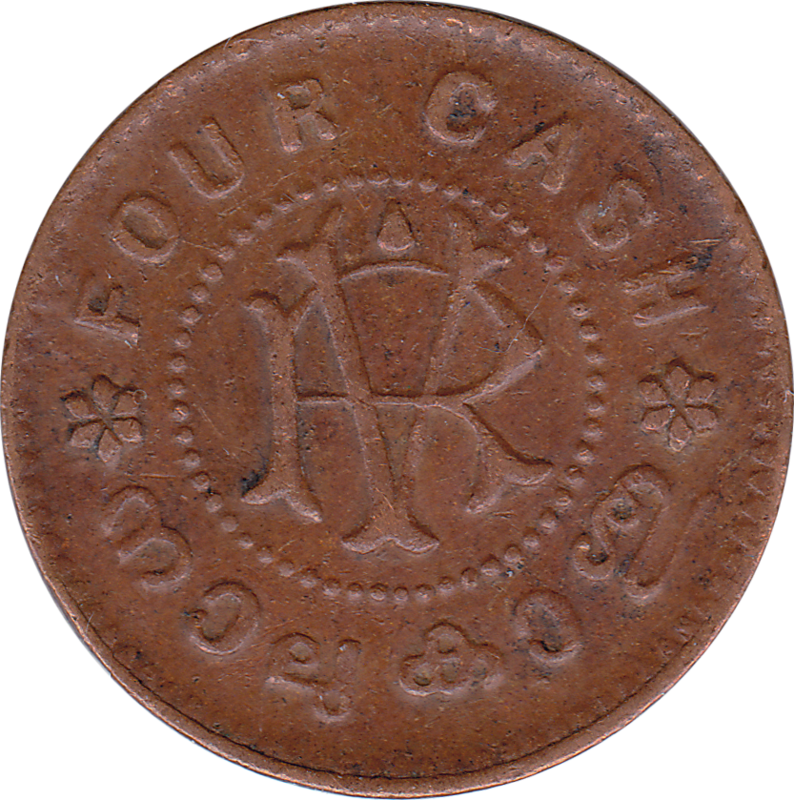 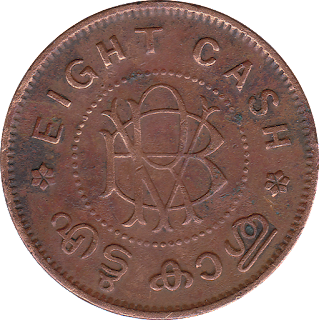 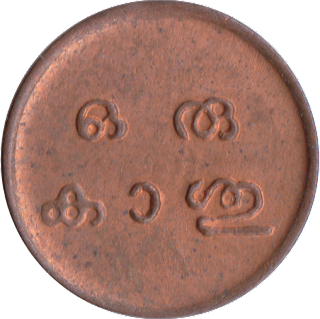 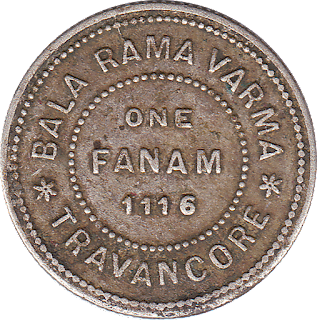 However, trade and collaboration with British lead to issue of machine struck coins in Travancore. 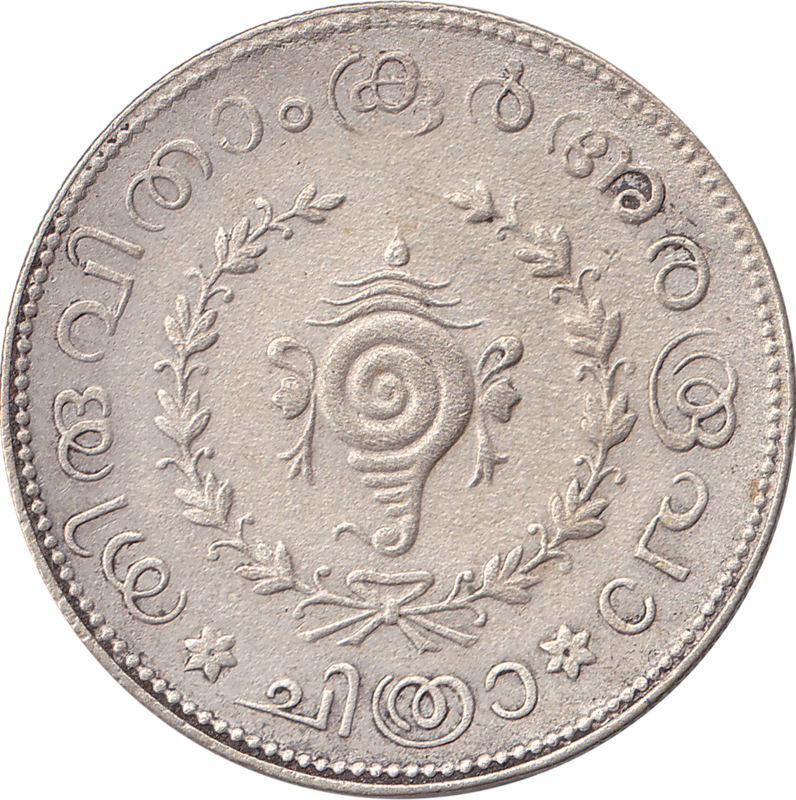 Here, I am posting some of the images of the Travancore coins. 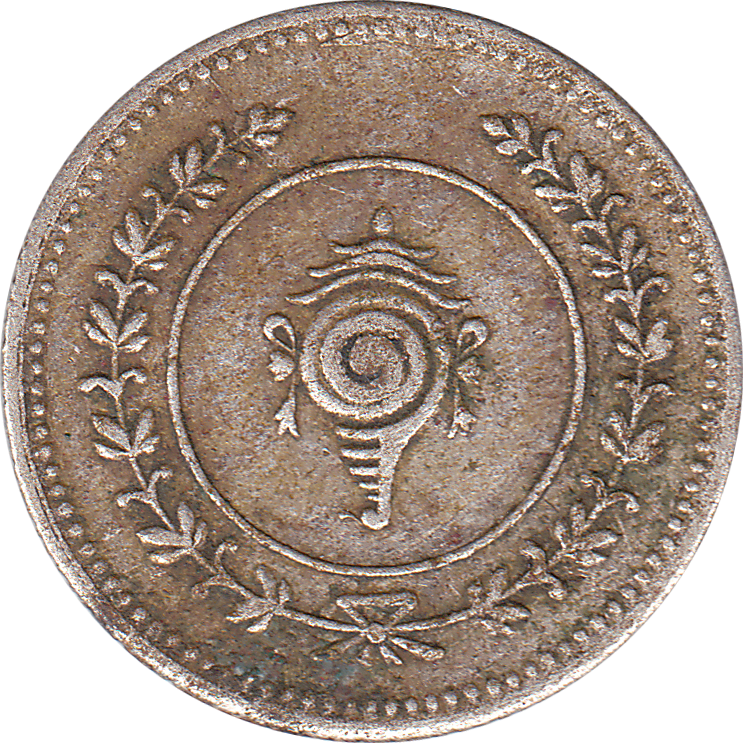 Most of these coins were in circulation during 1900s till formation of India in 1947(or may be till 1949). 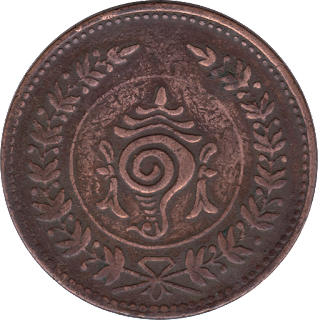 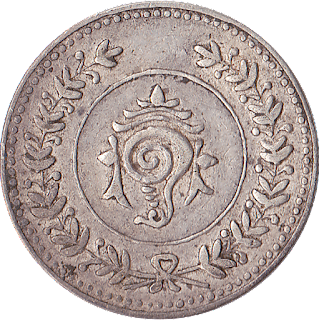 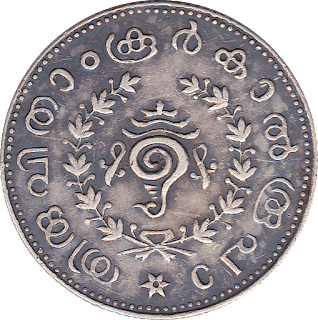 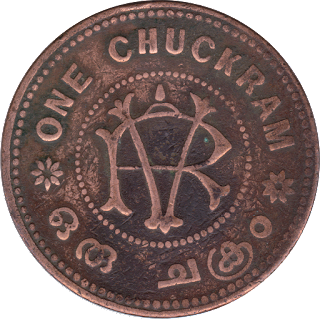 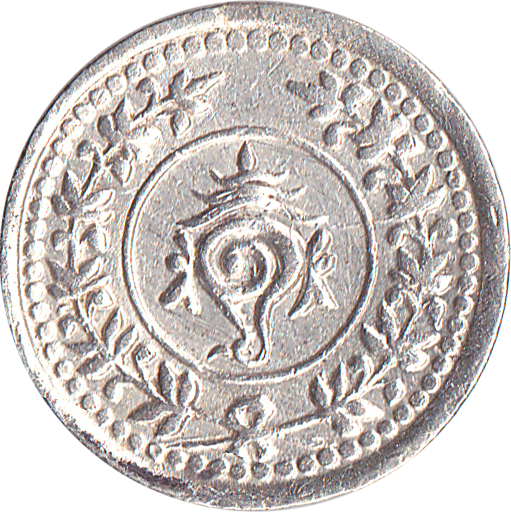 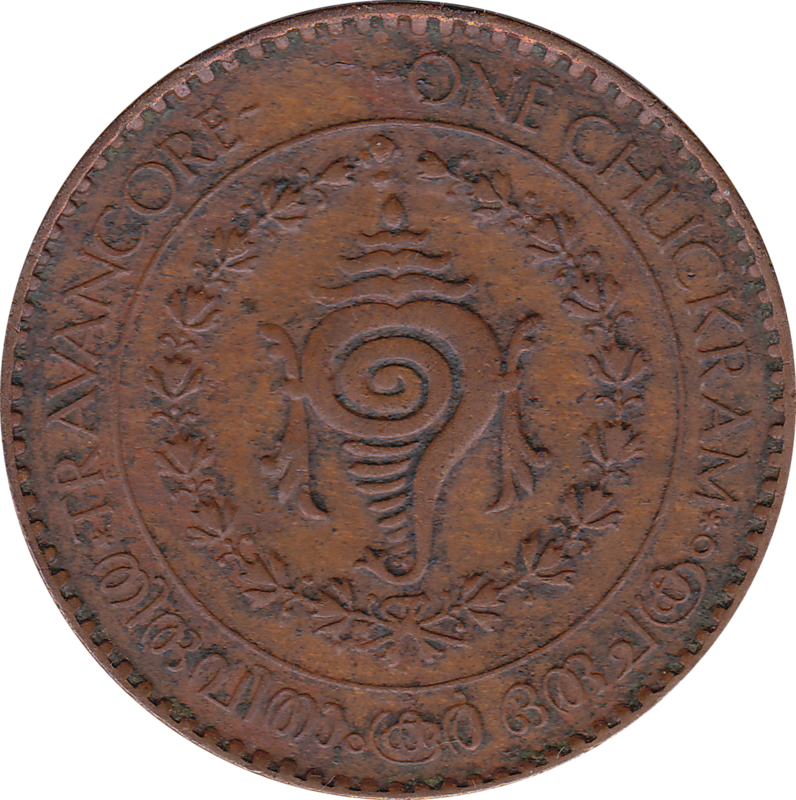 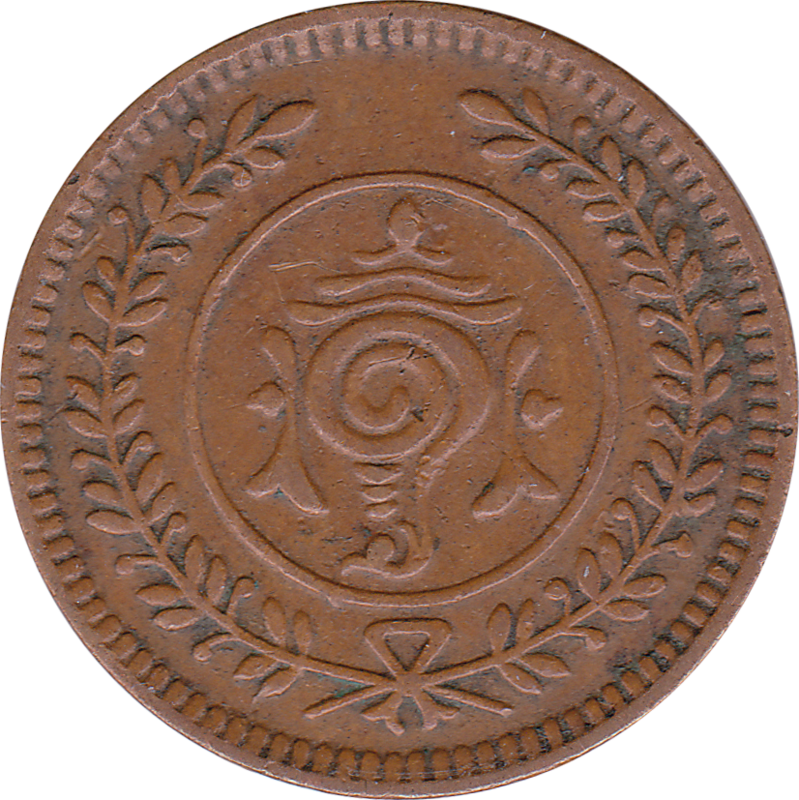 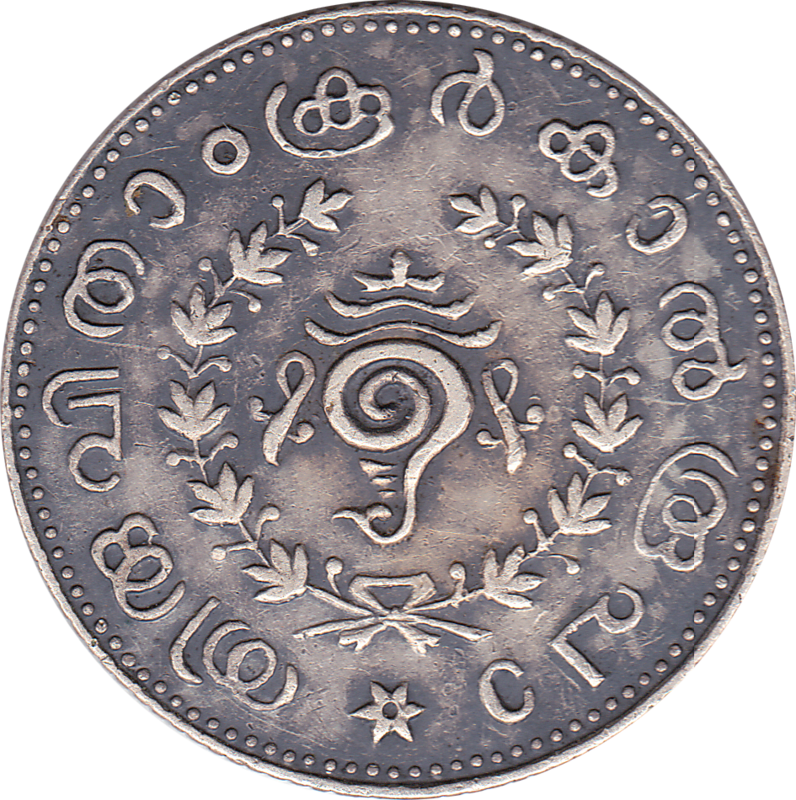 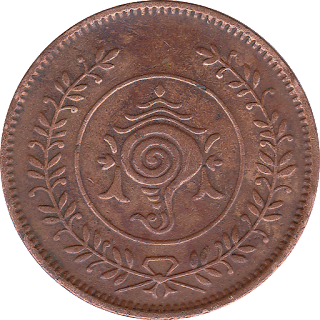 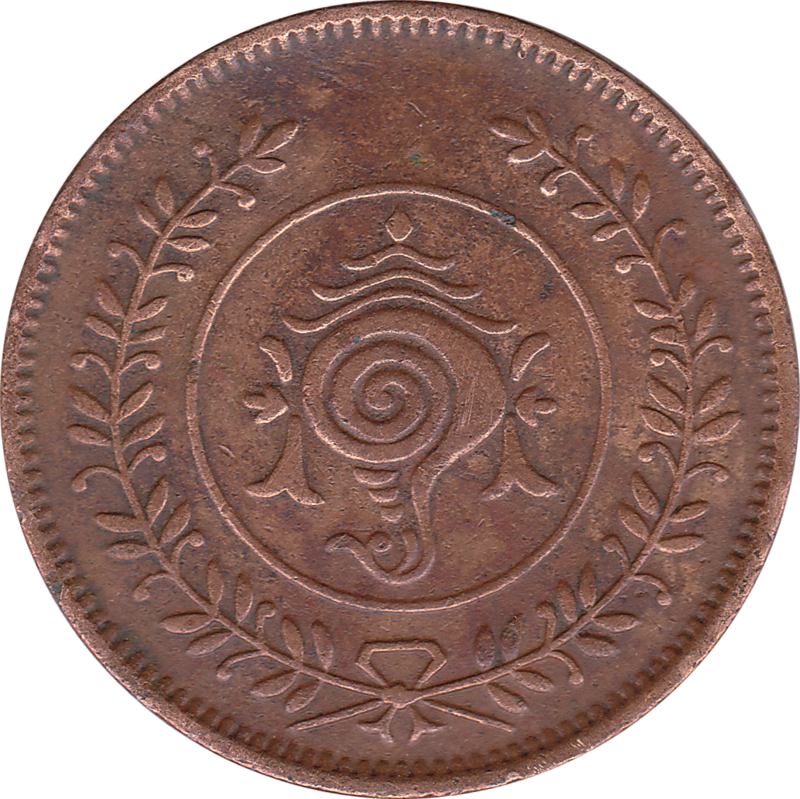 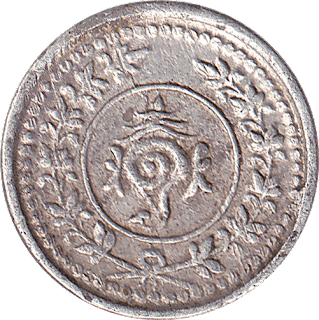 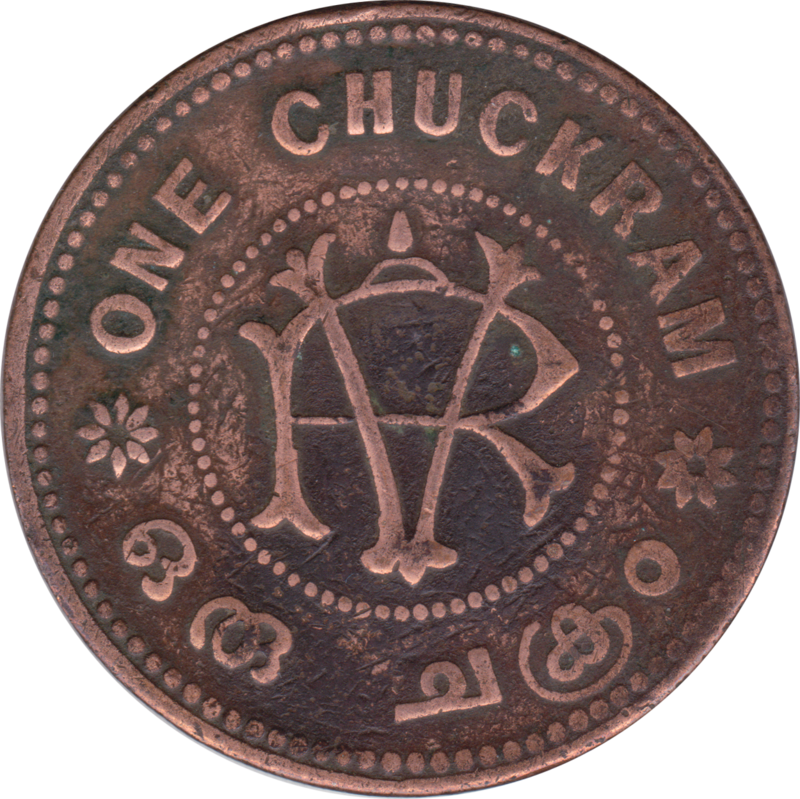 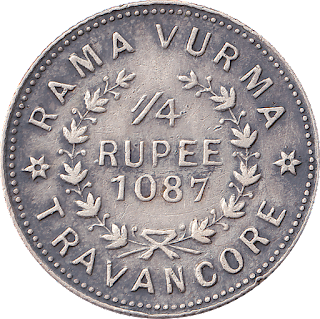 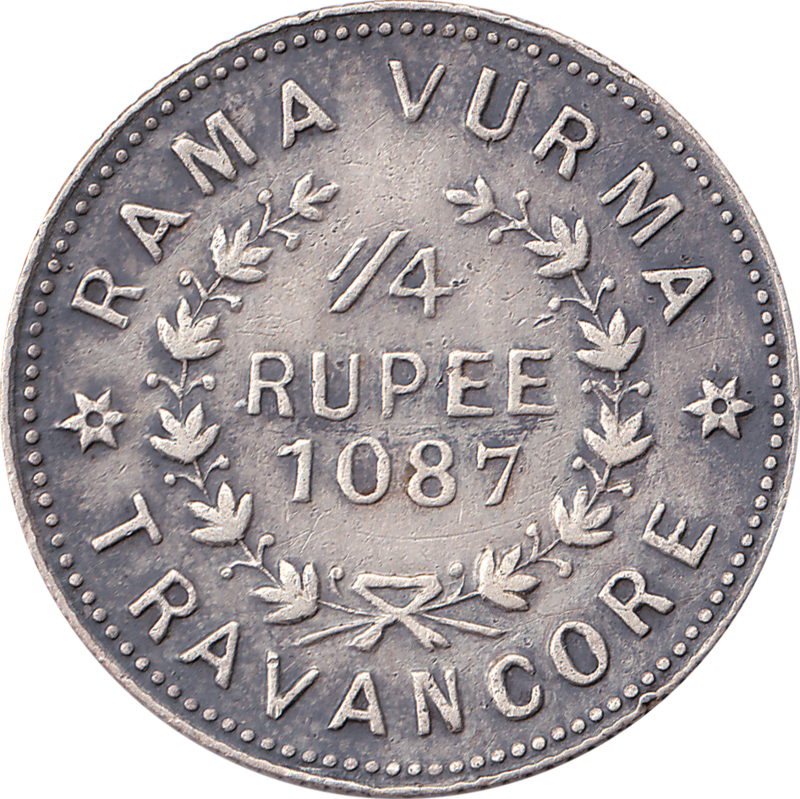 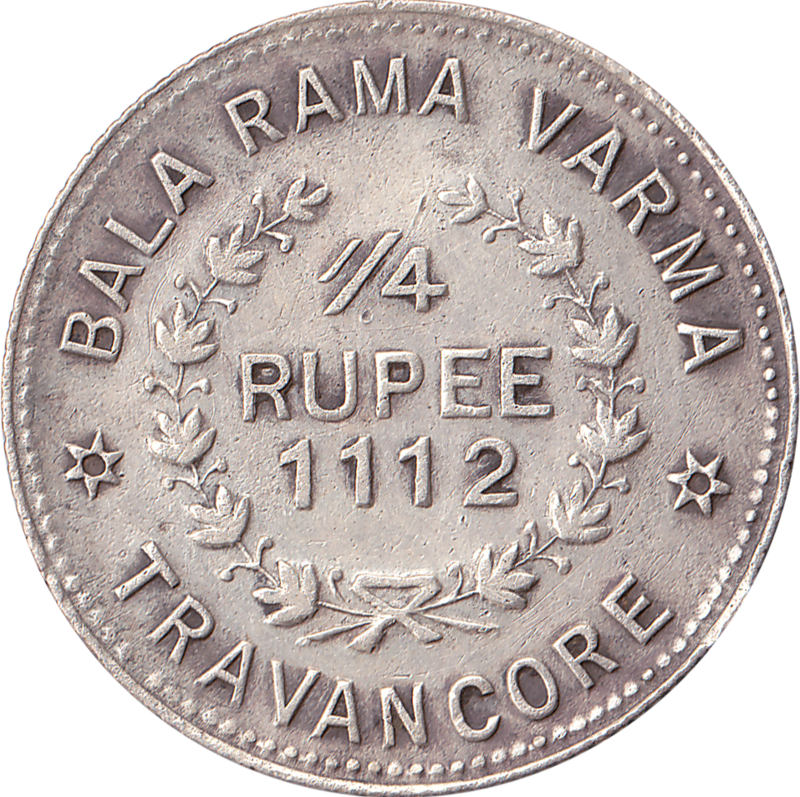 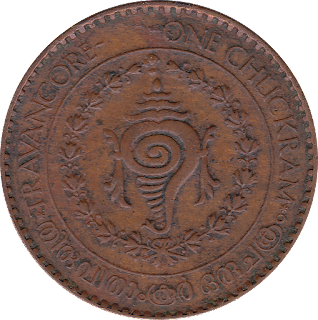 Travancore coin chuckram denotes the emblem or weapon of Vishnu who is the the household deity of the Travancore sovereign. Below are images of coins from my collection. Sorry, not all information like weight diameter are added for all images. 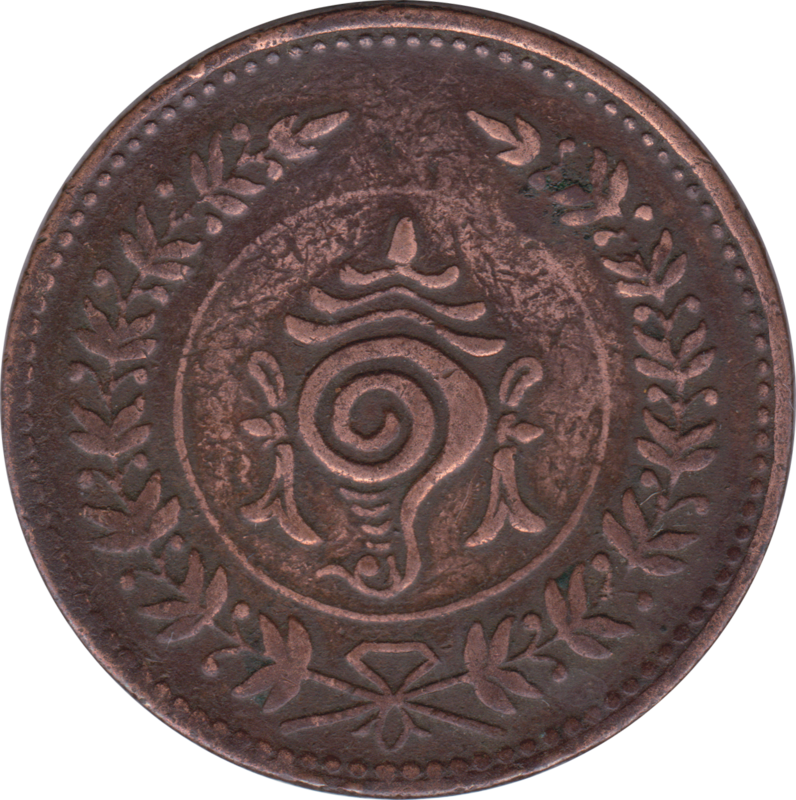 As I get time, I will add details for other coins also. Note: I am searching for better condition coins(which are at affordable prices). 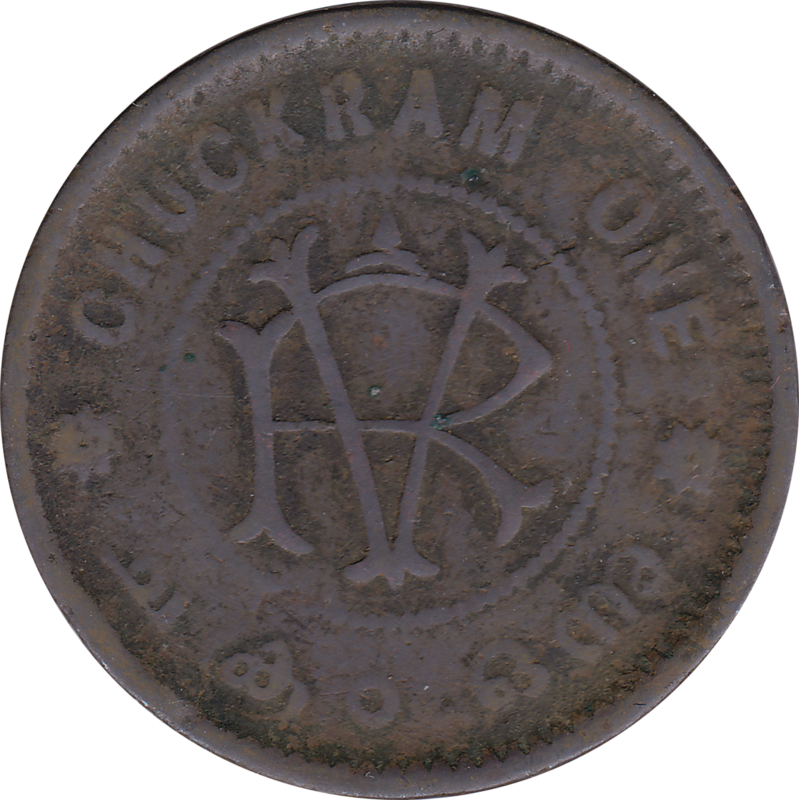 As I get more coins or coins in better condition that one listed below, I will update the images. 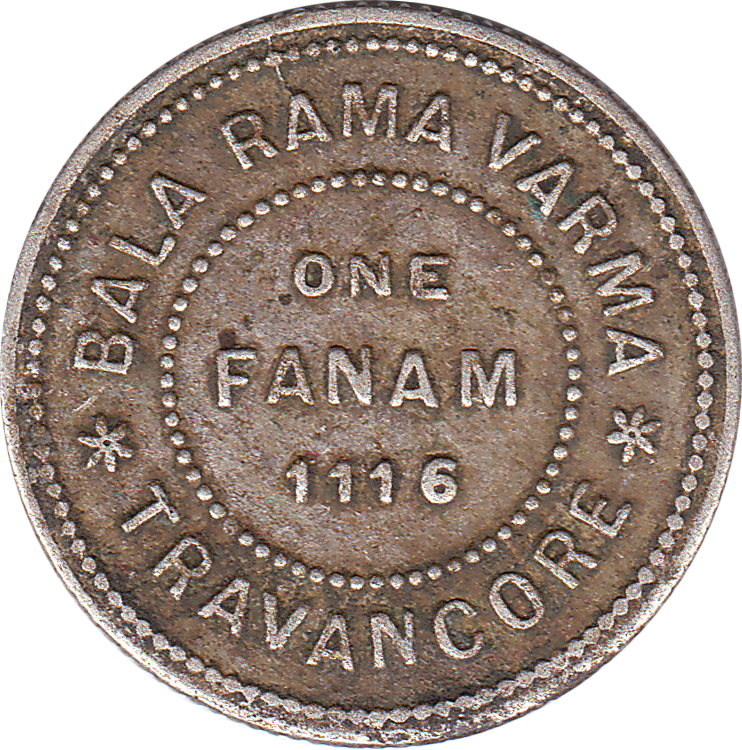 Issued by Maharaja Moolam Thirunal Rama Varma. 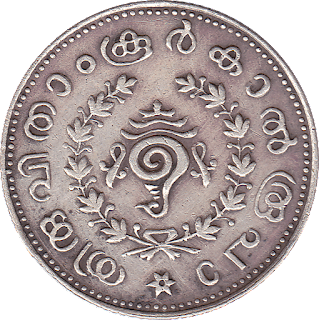 Also called as കൊച്ചു കാശു(kochu kasu) in malayalam. 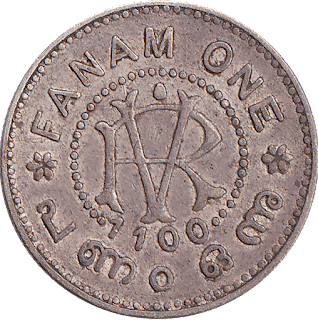 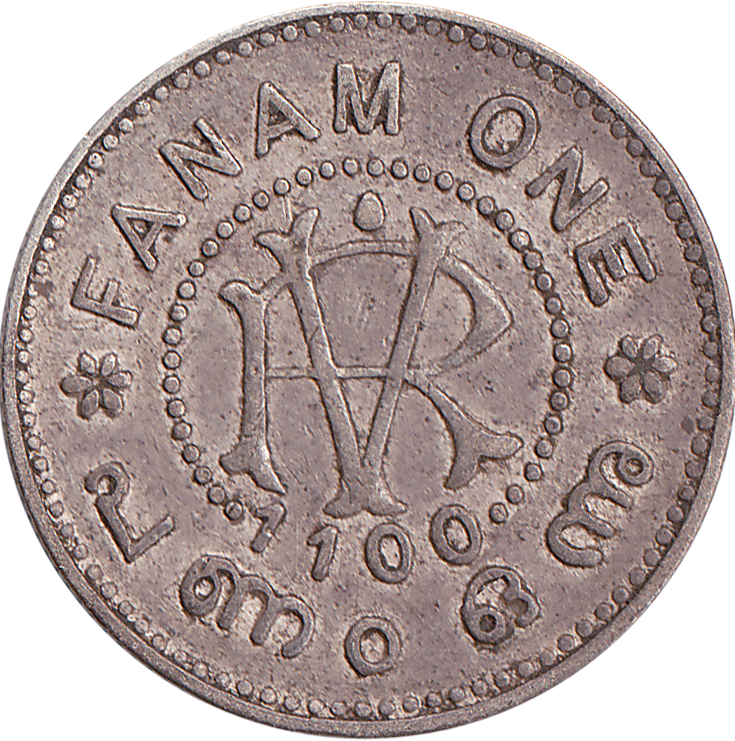 1100 KE (1924 AD). 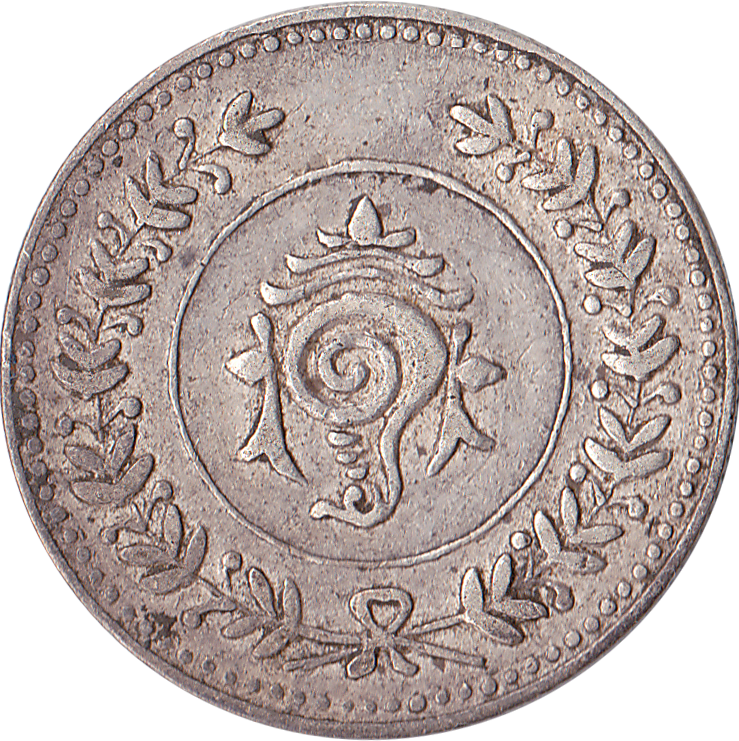 Silver coin Issued by Rani Setu Lakshmi Bayi - Regent(KE 1100-1107). #108 in Beena Sarasan's Book. Issued by Maharaja Chithira Thirunal Balarama Varma.